There is a two year old in our house that is jumping with joy about Christmas! He loves searching for his Elf on the Shelf, singing carols, helping to wrap presents, telling everyone it's "Jesus' birthday! ", and having his own little Christmas tree. 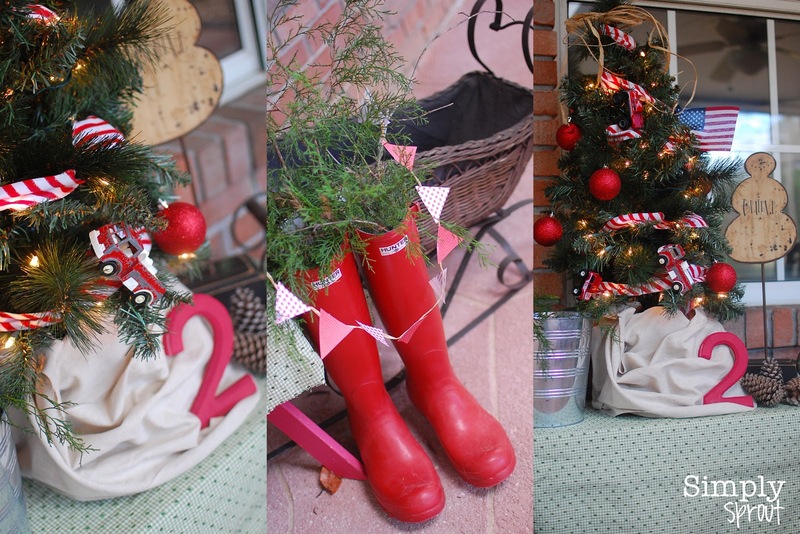 I decorated a mini tree just for him on our screened porch this year. He spends so much time out there, I thought this would be the perfect place for a special tree. I rounded up things he loves like Matchbox cars, flags, and shiny ornaments from around the house. We headed out back to cut some greenery for the boots, and he helped me make what he calls a triangle banner. It's the perfect festive touch to his little play area.